United fans breathed a collective sigh of relief when Anthony Martial’s agent said he’d be staying in Manchester for the foreseeable future. After having spent much of the season in and out of the side, it seemed as though he might be on his way out this summer. 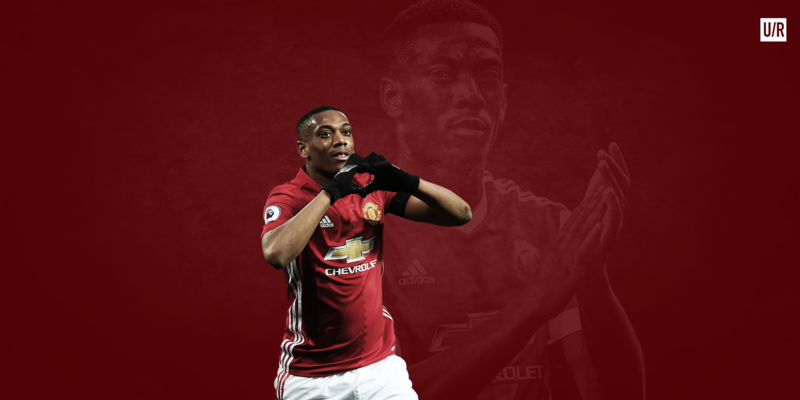 At 21, Martial came into the season facing personal struggles in his family and the pressure of improving upon his inspirational debut season. On top of that, he had his number nine shirt taken away from him to accommodate Zlatan Ibrahimovic. Fans can sometimes forget that footballers are regular people off the pitch. Martial is the same age as many of the younger players still in the academy, but there were moments last year where he carried the team like a veteran. Mourinho clearly expected this version of the Frenchman and was more than disappointed when he didn’t get it. However, as the year progressed on, Martial was able to make his way into Mourinho’s plans, either as a starter or as one of the first options off the bench. Clearly, Jose Mourinho still sees potential in the young forward and knows he can grow to become a stellar player at the club. Martial provided 17 goals and 8 assists last season when played primarily through the middle as a number 9. However, this season he was shifted out onto the left wing, where he added 8 goals and 8 assists in 25 appearances. For young winger, those numbers are actually quite good. More importantly, those numbers will increase with more time as the young Frenchman becomes accustomed to life out wide. Martial has become the type of winger who likes to come inside, pick up the ball, and then drive at the opposition to get a shot off or find a teammate. Completing 56% of his take ons, Martial was continued the silky dribbling that captured the imagination of United fans last season. At times, he can get dispossessed by defenders, but it is encouraging to see that this does not affect his confidence as he will often continue to go at his man. Martial pairs his dribbling with searing pace and an absolutely gorgeous inside of the foot finish that reminds many of Arsenal legend and compatriot Thierry Henry. To see all these traits in action, one must only look at his goal vs Burnley or last year’s terrific winner against Everton. With Ibrahimovic gone, Martial is likely United’s most composed finisher and that cannot be ignored. Even the seemingly imminent arrival of Alvaro Morata will not change that. This upcoming season will see a fight for playing time out wide, with Mkhitaryan, Mata, Rashford, and Lingard also looking for a place in the starting XI. Rather than spend money on an exciting but inconsistent Ivan Perisic, Mourinho should stick with the options at hand. A front three of Martial, Mkhitaryan, and Rashford behind Morata could pay serious dividends next season.